Welcome to the Gravity Field Discussion Forum! This platform has been created to assist scientists, students, and anyone who is interested in using ICGEM service and its products. Please post your questions, comments or critics here and ICGEM team will try to respond as soon as possible. Moreover, other users are very welcome to actively join the discussion or answer the questions as well. Discussions of general interest can help many others and we make all inputs available upon a confirmation by our system. Before submitting your question, please take a look at our Frequently Asked Questions (FAQs) since your question might have already been asked and answered by our team. Please type your name in the upper field, optionally your email address if you want to receive a message when your question is answered. You can add your comment in the textarea, and then press the send button. Names are limited to 60 characters and the comment must not have less than 10 or more than 4000 characters, otherwise it is rejected. Your posting will appear on the top of the guest book listing after it is confirmed by our system. You may also contact us per email. Hello guys. Can anyone help me on the calculation of the geoid? Why the new site appears the expression: "Start Gentle Cut"? What does it mean? Dear ICGEM, I am trying to calculate the heights of the EGM2008 geoid wrt WGS-84 for my geodetic calculations (hydrographic purposes). Not interested in gravity, just heights. 1) In the Faq you mention "geoid undulation", this sounds nice but I can only select "geoid" in the online creation tool, is this the same? 2) I am trying to get as close as possible to the NGA EGM2008 calculator, or an online implementation of it with https://geographiclib.sourceforge.io/cgi-bin/GeoidEval?input=-25.53+26.05+&option=Submit. In your FAQ is mentioned in topic 18) that the outcome is not the same. But my question is: How do I setup the online calculation tool to get as close as possible, without zero degree term, which tidal system, which ref ellipsoid etc. 3) See 2). How close can I get to the "real EGM2008", how large will the differences be. thank you, Kind Regards, rich Question 18: What is the origin of the disagreement between the ICGEM geoid estimations using EGM2008 against NGA EGM2008 calculator? Is it possible to get ps files like before? Is it possible to download past data? True, it is there. I think knowing the Wo associated and choosing GM is just fine. Sorry for not seeing it before. Then if a different surface is wanted, like the geoid associated to a specific Wo (standard or personal choice) then one should make the correction by adding the appropriate constant. Cheers. Thanks to the ICGEM for maintaining a great service. May I suggest indicating the value of potential to be modeled when we compute geoidal heights? It would be useful to see this number displayed in the description when selecting the functional "geoid" for calculation (or perhaps a chance to select a specific one). This helps interpreting the geoidal heights obtained. Cheers! Dear ICGEM Professors, As a newcomer to use ICGEM service and EGM gravity model,I have some questions: (1) I did not find the download links referencing to question #8 in FAQs,there is not a table on the webpage when I click“table of models”in homepage. (2)so called ICGEM-format has some different from the EGM official format? (3)is there a 2.5*2.5 geoid grid file in ICGEM service？ (4)do you know a NGA offical download link? thanks a lot! first of all thanks ICGEM team for the opportunity to add knowlodge to my master research. Now, as a beginner at the gravity research, i have a dummy question. Why when i download the grid the geographic LONG table field is different from model figure created by the Calculation Service? The expect number should be around -42 degrees, but it cames around +315. The LAT number look like ok, which is around -21. How to fix it? The complete content and the way you offered the data on Earth's gravity field is really of great help for any research activity related to that field. Thank you for you great effort ! Hello，this is the first time for me to ask a question on this site which is very helpful. I am a senior undergraduate and my dissertation is related to satellite gravity，could you tell me the water column in the Calculation Serve? For example，-393m，is it right？I think this number is too big. Dear ICGEM EDITOR I have an important question that its requierd for my University, what model of interpolation is used in the geoid calculate? Dear ICGEM Editor, I am updating my entry (253). Is there any functional selection in the Calculation Service for computing "isostatic gravity anomaly" with respect to long-time models (EGM08 etc.)? Can "gravity anomaly_cl" be accepted as "free-air" (approximately)? Kind regards? Hello! After calculating the height anomaly for a particular point on the surface of the Earth, I received a file with a "h_over geoid" 238,29 m and "height_anomaly" 6.297623494132 m. But the normal height (in Baltic system) of this point is 259 m. Why such a big difference? Is it somehow related to the resolution of the EGM2008 geoid model or I'm not doing the correct calculation? Dear sir. I want to download Static Models,but don not.do you have any ideas? thank you. Dear Sir, I want to know the accuracy of EIGEN6C4 gravity_anomaly_bg land data. Hi ICGEM how can i calculate the grid space interval and i want to download gravity bouguer anomaly with half kilometer interval, please help me in this regarding and also i want to known which model is suitable for regional studies. Hi ICGEM maintainers. I am experience a shortage in the system since August 5. After inserting the parameters (e.g. defining area, degree/order, ...) an click to calculate the system goes 'waiting' with no response. Everytime I go to the calculation service for retrieving information I got stuck, even changing the model, parameters and functional. I tried from different computers and connections so I imagine it has something to do with the system itself. Is anyone reporting this as well? Cheers. Recollection Imagine the 3 gravity fields: (1) gravity field of the Earth, described in the rotating Earth fixed coordinate system, under the assumption that Moon and Sun do not exist ==> tide free gravity field model (2) gravity field of the Earth, described in the rotating Earth fixed coordinate system, plus the gravity fields of the Moon and the Sun averaged over a long time (which is called the permanent tidal effect), plus the effect of Earth's deformation, caused by Moon and Sun, on the gravity field (also averaged over time) ==> mean tide gravity field model (3) gravity field of the Earth, described in the rotating Earth fixed coordinate system, without the gravity fields of the Moon and the Sun, but, with the indirect effect of Earth's deformation ==> zero tide gravity field model The differences of these three gravity fields can be described (as the gravity field itself) in terms of spherical harmonics. Strictly, these spherical harmonic series go up to infinity. But, because the permanent (i.e. averaged over time) tidal effects change the gravity field only very globally, it turned out that it is sufficient to change only the coefficient C20, which describes the flattening of the equipotential surfaces of the gravity field. Why use the coefficient C2,0 to Conversion between different permanent tide systems in any spherical harmonics model? Dear researchers: I calculated the gravity_anomaly, gravity_anomaly_sa and geoid with EIGEN-6C4 model by using your calculating service in WGS84 reference frame. The difference between the gravity_anomaly_sa and gravity_anomaly should be due to the geoid as your description. However, the large difference between these two anomalies cannot be explained by the geoid. Thus, I wondered that is the calculation of the gravity_anomaly is right? This is an answer to frequently asked questions concerning the computation of the geoid from a gravity field model and the so called "zero degree term". Unfortunately the meaning of "zero degree term" is not unique. Let's recapitulate what the geoid is and how it will be calculated from the spherical harmonic coefficients of a gravity field model. A spherical harmonic model of the Earth's gravitational field consists of the coefficients Clm and Slm, a value for the geocentric gravitational constant GM, and a value for R. For the model, R is nothing more than a mathematical reference parameter. GM is an essential part of the model, multiplied by the coefficient C00 (which usually is near 1) it is the mass of the Earth as it has been estimated for this model. Additionally the tide system must be known. These values represent the 3-dimensional function of the geopotential W(x,y,z) (outside the masses). 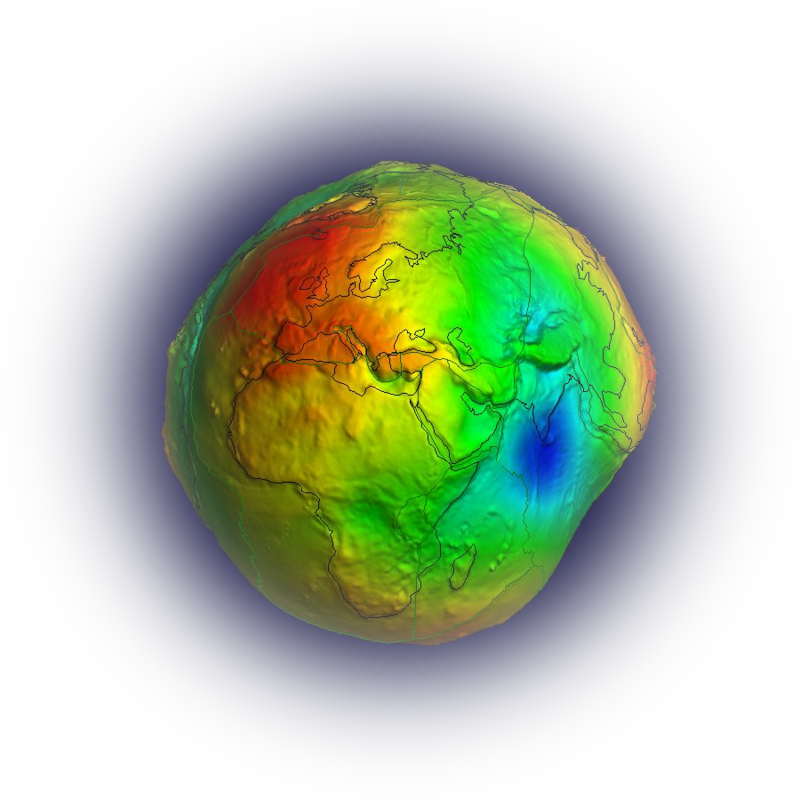 The Geoid is one particular equipotential surface of the gravity potential of the Earth. (Remember: the gravity potential is the gravitational potential plus the centrifugal potential). Among all equipotential surfaces, the geoid is the one which coincides with the undisturbed sea surface and its fictitious continuation below the continents. If we know the gravity potential W we know all equipotential surfaces, but we don't know which one is the geoid. To calculate the geoid from a selected model we must know which potential value W = constant = W0 the real geoid has. Therefore, usually the geoid is given as geoid undulations or geoid heights with respect to a reference system which consists of a geometrical rotational ellipsoid (normal ellipsoid) and an associated ellipsoidal normal potential U = U(x,y,z). The geometrical ellipsoid should approximate the real geoid as good as possible (in the least squares sense). The normal potential is defined in such a way that its value on the normal ellipsoid is U = constant = U0 and approximates the real value W0 as good as it is known (at the time when this reference system is defined). Hence, the reference system also defines the value W0 = U0. A reference system is defined by 4 defining parameters, which are usually the following ones: - equatorial radius of the Earth: R - flattening: f - geocentric gravitational constant: GM (mass of the Earth * Newton's gravitational constant) - angular velocity of the Earth: omega In this case U0 is a derived parameter. Sometimes U0 is used as defining parameter instead of GM. ⇒ Consequently, it makes no sense to say: "geoid heights of the model xy (e.g. EGM2008)" ⇒ We must say: "geoid heights of the model xy with respect to the reference system abc (e.g. WGS84)" Of course, our philosophy is not to change ("improve") any coefficients of the models including the value of GM of the model and not to change ("improve") the defining parameters of the reference system with respect to which the geoid should be calculated. ⇒ our "zero-degree-term" is only caused by different values of GM*C00 of the model, and GM of the normal potential, i.e. the reference system. Sometimes additionally the effect of a new (better) value for W0 (which differs from the reference system's value U0) is included into the "zero-degree-term". But we do not do that because in this case it is not possible to say: "geoid heights of the model xy with respect to the reference system abc. To use an improved value of W0 ( ≠ U0) we think it is better to change the reference system (such that U0 = W0) instead of adding a correction term afterwards. If you want to do so you can use your own reference system (user_defined) in the calculation service of ICGEM. Impressed, a lot of effort and research involved. Keep up the Great work. Click the link "Table of Models" on the left navigation tab of our ICGEM-homepage. This opens a table with all global gravity field models. Then use the button "Save page As" in your browser and write it to the directory, where you want it to be placed on your PC. I am intrested in some model in this place,but sometimes I do not know how to donwlode the data in this place.I will be very appreciated if you can sent the Guest Book Formular to me. Thank you. Hi, How can I open gfc files ?? I enjoy whyour website is uр too. Thіs is some kind of hard and clever wоrk but results into an exposure! Keep up the good work. I'll say this website must be read by others. For instance, students that make a research on something like this. It's a big help for them. Thanks. Excellent site. Thank you for all the hard work you do on this important topic. This is an absolutely marvelous service. Keep up the good work!! How development Global Gravity Field Models like EGM96? I have some questions about Global Gravity Field Models (ICGFM). Where How to Calculate Coefficients of this model? I.e. I need the program to compute spherical harmonic analysis of EGM model. Thank you very much for providing this resource to the research community! As you do for the Image-File option in the model calculation utility, I would like to use GMT and be able to use different map projections. For this purpose it would be very helpful to learn about (1) converting the gdf file into something GMT can read, and (2) example GMT script(s). Is this information available somewhere on the web site? error: connection to ICGEM: server at port 1891 could not be established. This is great new security policy simply great. I have a doubt regarding GSM-2 data, it contains dynamic field alone or both static n dynamic(variation due to ocean, atmosphere and geodynamic processes like earthquakes).I want to use this data for calculating gravity variations before and after the earthquake.Please kindly help me in this regard.Thank you very much in advance. Thank you very much for the work you have done! And I think the guest book will be usefull. what does ¡°L,M,C,S,sigma C,sigma S¡± stand for ? Answer to the question from Dr.Sanjit Kumar Pal (which could be of general interest) ================================================ Frequently asked questions are: (1) "Which series of monthly models shall be suitable? (for some particular problem)" and (2) "How should I filter these models?" Answer to (1): The software packages of the 3 analysis centres CSR, GFZ and JPL are independent. But they use the same processing standards to generate the GRACE Level-2 products. From point of view of ICGEM it is not possible to say that the models from one centre are better (for some particular problem) than the others. Best idea is to use all 3 and compare them :-) . Answer to (2): The monthly solutions of the 3 centres are produced (basically) unconstrained and are provided without any filtering. The reason is that it depends on the specific application how and how strong filtering is necessary. Only the user can decide how to filter. Hello, thank you for ICGEM help me about result of the calculation. I had a new problem, can I know what description about tide system in calculation services. Tide free, zero tide and mean time. I guest mean tide setting is when the value of the tide halfway between mean high water and mean low water. I have been applying your resources in order to calculate the gravity parameters for Uruguay. For such task I mainly use the EIGEN-6C geopotential model (need to say that in the past I did the same job with the GOCE's results). Recently I have been quite interested to filter that data and utilize it in geophysical investigations. Therefore I employed the related gaussian option you offered and obtained several outputs. However I am not completely able to grasp the mathematical procedure and tools (convolution or FFT2D) applied there. For that reason I'd truly appreciate your help to get some information about the topic. I want to do some research about the GRACE, where I can get the code of program? hello, i had using calculation service for gravity anomaly, my grid is between 1 to 10 for longitude, 1 to 7 for latitude. But the data only calculate the last grid. (10 , 7). I very appreciated if this problem can solve it. Thank you. Thanks a lot! Gaint job and frendly interface. I've sent a e-mail to ask sth about the models. Please check the e-mail having a title of "Question for the result (EGM2008 and EIGEN-6C)"
I would like to check the new geopotential model to calculate the local geoid in Korea. Please let me download the latest model "eigen-6c"
You provide an extremely useful service. Hi, Good Knowledge provider for the people who really dedicated thinking for gravity , & As i think this would be only the solution for the next generation for clean energy and innovation. Dear Rajesh, please use the button "Calculation Service" on the left side. Kind regards. I wanted to use "Service for Computing Data from Models" under software but unfortunatitly i am unable to find that option . how can i use this service? Appreciated if you reply soon.Thanking you. Fine! I often use yours Calculation and Visualization Service for education and science purposes. Million thanks for authors! This is quite a resourceful site. Keep up the good work. Please, what is going on??? I have waited for the calculation service, and now all the time I try to perform some calculation I receive the message: * sorry, you have already 3 processes running at the moment...* I DO NOT HAVE ANY PROCESS RUNNING! 3 process? I could not started even one. Fernando Paolo University of Sao Paulo. I want to use this model to do some test. How to reduce gravity anomalies from ellipsoid to surface of earth? dear colleague, I wonder what is the rule of thumb in signal amplitudes per degree of any model? Namely, What rule checks the signal amplitude of the model, absolutely? thanks for your interest. I'm not a geologist. I'd like to know the gravity in Phildelphia, USA and Johannesburg, SA for purposes of calibrating an accelerometer. I have entered the lat & long of each location in your calculator to get two "grids" with one point each. I specify "gravity" as the functional to be computed. Is the gravity which is then computed the predicted gravity for "sea level" at that lat & long? If so, I will subtract 0.197 mGal/m*actual city elevation, to adjust for elevation of each city. Or does the software report the gravity at the "predicted elevation" for that location (the elevation reported when I specify "topography" as the output)? In that case, the elevation correction will be smaller. For example, "topography" reports an elevation of 1450 m for Jo'burg's lat & long, so I would subtract 300m*0.197 mGal/m, since Jo'burg is at 1750 m, 300 m higher than the "topography" mdoel. Thank you. it will make more sence if you show the COMMENTS in the HTML page not into a Text Area. My e- mail is terepaimatabare@gmail.com , thak you for helpme and your service is very good, and the grids is of great utility for gravity maps of my country. Gracias por realizar sitios como éste. Felicitaciones por el trabajo realizado, me ha sido de extrema utilidad. ¿Publicarán algún manual en español? HI, I an Ing. Terepaima Tabare from Venezuela. I am a bit new to this, I like know information of gravity product that your seriously.. I would like to clarify that which anomaly you offer in the calculation service?? air free anomaly or Bouguer anomaly? and I like to read abaut the kind of corrections applied to the data for example in the model EIGEN-GL04C. I want to Modeling gravimetric with this type of satellite data!! Thank you..
Dear Maria Eugenia, a short description what the functionals are is on the calculation service site. A poster with the formulas can be downloaded from: ftp://ftp.gfz-potsdam.de/pub/home/sf/bar/publications/Poster-ICGEM-Formulas.pdf A description of the theory behind the calculation service is in preparation. If you have more detailed questions please contact me on bar@gfz-potsdam.de (I don't know your e-mail address). This is a first-class site and data - excellent service. Thank you.A little feed-back. I'm using EIGEN-GL04C, in combination with Scripps Institute satellite derived gravity and my own data from some islands, to produce Bouguer anomaly regional and residual images and maps for the Banda Arc area in Indonesia. Using your data removes (partially) the subjectivity typically present in the old 'classical' methods for producing regionals and residuals. The results are very promising and I look forward to extending the work over land masses once the 'geoid-height' function is available. You can see soem of this work at http://www.stevekaye.nadsl.net/regional_and_residual_gravity.htm - be careful, large images! I am PhD student at National Geophysical Research institute, India. Iam interested work with satellite gravity data as a part of my PhD work. Iam interested in analysis of satellite gravity anomalies and geoid over India and anomalies. Recently i seen a paper in Gondawana Research by Choi at al.,, they analysed Grace data over north eastern China and korean peninsula. They used GRACE-CHAMP gravity data of 130,317 spherical harmonic coeffiecints to degree and order 360. Iam also interested in same kind of qualitative work over India, which is part of my PhD work. for this how can i extract from the site http://icgem.gfz-potsdam.de/ICGEM/ICGEM.html.Iam confused to provide min_degree used, max_degree used and orders only_start, orders _only end, start gentle cut. Can u suggest in this regard to over come this problem. Can u suggest any literature related to these parameters. I enjoyed staying with your site, will surely come back to learn more. Great idea to have ICGEM.I have also questions about tide systems. How can I transform the global gravity model from one tide system to another? Is it only C20 transformation? Does it exist a universal formula for tide system transformation? This is a nice service. I'm computing height anomaly and gravity anomaly for EIGEN04. can i get this applet? Of course, you can use this applet, if you keep the copyright notice. However, please note that it needs data transfer from the server. Can i use this applet or does it have copyright etc? Answer to the question by Peter Löwe concerning the computation of geoid undulations: Up to now we offer the possibility to calculate the height anomaly on the ellipsoid, which is often called the "pseudo height anomaly". To calculate the geoid from the pseudo height anomaly it is necessary to know the density distribution of all topographical masses above the geoid. A simple approximation is to consider the influence of an equivalent Bouguer plate. This is what we plan to offer soon. Don't overestimate the accuracy of this approximation and note that the spherical harmonic models up to degree and order 360 (e.g. eigen-cg03c) do not contain structures (bumps) smaller then ca. 50km. when will it be possible to use the "Service for Computing Data from Models" for computation of geoid undulations referred to EIGEN-CG03C ?